A full throttle of high-octane flavor! The CAO Flathead collection are hand-rolled premium cigars that brings back the classic American muscle car nostalgia. Each of these premium cigars are box pressed, created individually by the master rollers at the CAO factory in Nicaragua. 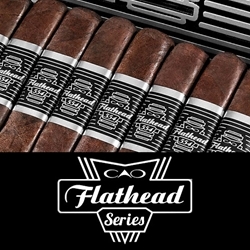 CAO Flathead series consist of perfectly aged Nicaraguan tobaccos, with Ecuadorian Connecticut binders wrapped up inside a dark, oily Connecticut Broadleaf. The retro design of every CAO Flathead cigar box resembles an old school hot rod engine block from the 50’s and 60’s. A collectible, pin-up girl flysheet is included inside, with the lid that’s removable making it a perfect wall art to hang in any car enthusiast’s garage. If you enjoy having a relaxing full flavored, full bodied smoking experience, Smokers Discounts online cigar store can bring this comfort to you with a box of these high-quality handmade cigars. We’ve made it easy and affordable to buy premium cigars online. A variety of sizes and flavors are listed below. Each of these styles are in stock and available for a low discount price! Call us for more details!